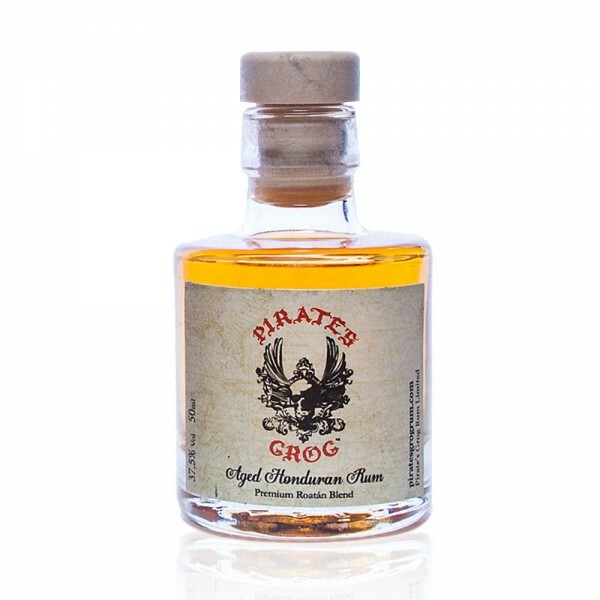 Pirate's Grog five year old rum is a premium blend rum, exported out of Honduras. This exceptional rum is aged in American oak, bourbon barrels for five years before being blended in small batches on the Caribbean island of Roatán (which is famed for its pirate history). The resulting rum is perfectly smooth with rich flavours of vanilla, butterscotch and raisin. Sample this miniature bottle over ice or mixed in a refreshing 'Golden Pistol' cocktail: 40ml Pirate's Grog, ginger ale, ice and plenty of fresh lime.